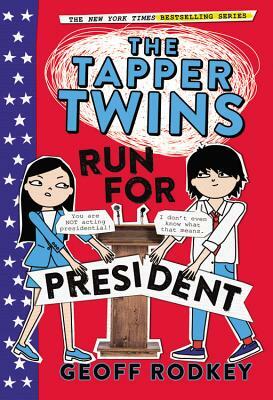 In their third uproarious oral history, the Tapper Twins take their sibling feud to the political stage as they race to become class president! Told as a series of interviews, screenshots, text messages, and social media bursts, The Tapper Twins Run For President tops the antics of the real 2016 elections! Claudia Tapper wants to become President of the United States someday. She's the sixth grade class president, and has every reason to presume she'll get reelected. Reese Tapper could not care less about student government--until he learns becoming class president is his best shot at overturning a hated new rule. And thus, the greatest political rivalry in Culvert Prep history is born! In a tangle of evil-genius advisers, meddlesome best-friends, negative campaign attacks and outrageously funny missteps, Claudia and Reese duke it out to see who will rule the school. "Everyone--not just native New Yorkers--will enjoy this madcap, uproarious romp around the Big Apple.... It won't take long for fans of the first installment, or new fans, to drop right into the action, hilarity, and mayhem."